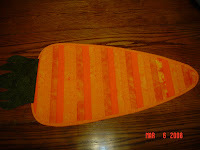 This is a photo of a table runner I made for myself. I saw the pattern on-line last year and decided to make it a few days ago. It is really quite easy and quick to make!